RaceRoom and AVIA Racing have partnered up to organize a new eSports Competition. Participate in the online competition, qualify for the on-site final at the Nürburgring and compete for prizes with a total value of over 6000 €. The Avia eRace championship consists out of online multiplayer races and an on-site final at the Nürburgring. International players are eligible to join the competition, but please keep in mind that part of the championship involves traveling to the Nurburgring. Only your fastest time counts! 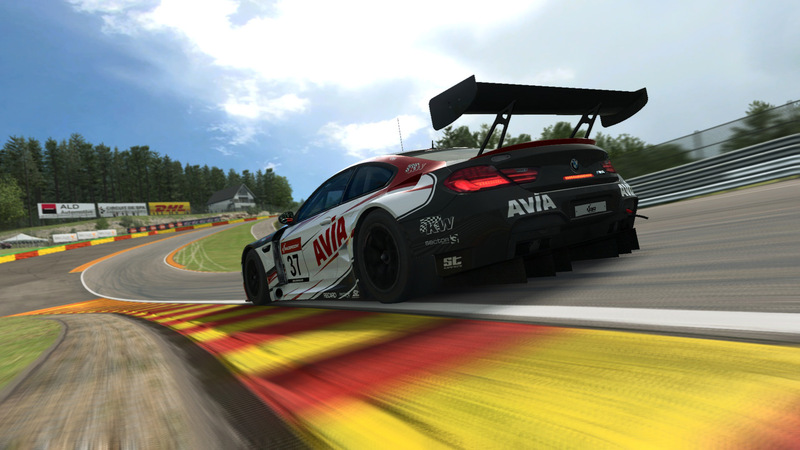 Show how fast you are with the AVIA racing BMW M6. You can always join for free and drive as many laps as you want. There are 4 time-trial competitions. Each driver has a driver’s license. Experienced RaceRoom drivers with license A drive in the professional class, while drivers with license B, C, D and newcomers to the rookie class drive. The fastest 32 riders in the professional class, as well as the fastest 32 rookie-class riders, will be invited to a multiplayer race at the end of each lap. The invitation will be sent by e-mail. The race of the professional class will be broadcast live online, with commentary. Points are awarded in the multiplayer races. The scores of the professional class and the rookie class are managed separately. For the drivers on the podium, there are prizes worth € 900 in every race. Qualify for an experience of a special kind online! The top 20 riders from the professional class and the best 20 rookie-class riders will be invited to an adventure weekend at the 2nd VLN race at the Nürburgring on April 13 and 14, 2019. The highlight will be on April 14 In each class a final run in the RaceRoom Café at the ring ° boulevard is extended, where all participants can compete with identical RaceRoom racing simulators and secure further prizes – the main prize is a suspension from KW suspensions! An overnight stay from April 13 to 14 at the Lindner Congress & Motorsport Hotel Nürburgring, as well as a VIP package for the VLN race are included. The journey is self-directed. The legal process is excluded. For every online race: winner of the race – Amazon voucher worth 200 €. Runner-up of the race: Amazon voucher worth € 150. Third place winner of the race: Amazon voucher worth 100 €. Invitation to the VLN at the Nürburgring, overnight from April 13th to April 14th, entry rights to the final in the RaceRoom Café. winner of the race: Amazon voucher worth € 400. The winner of the race in the professional class will also receive a suspension from KW suspensions. Runner-up of the race: Amazon voucher worth € 300. Third place winner of the race: Amazon voucher worth € 200.